This double-decked tour boat offers daily narrated cruises of the Hampton Roads harbor and Chesapeake Bay, featuring Hampton’s seafaring culture, local fishing boats, mighty commercial cargo ships, Blackbeard’s Point, Old Point Comfort, Fort Wool and the awesome gray fleet at the world’s largest naval installation, Norfolk Naval Base. Tour length: 3 hours. Special tours, programs and all-day cruises available. Purchase tickets in the Hampton Maritime Center. As the top-rated tour in the city of Hampton, with a five-star rating by Tripadvisor.com and awarded TripAdvisor Certificate of Excellence for the past two consecutive years – reservations are a good idea for these popular tours, but not necessary. The educational floating tour has been operating for a quarter century, showing and telling in an accurate, detailed and entertaining fashion. 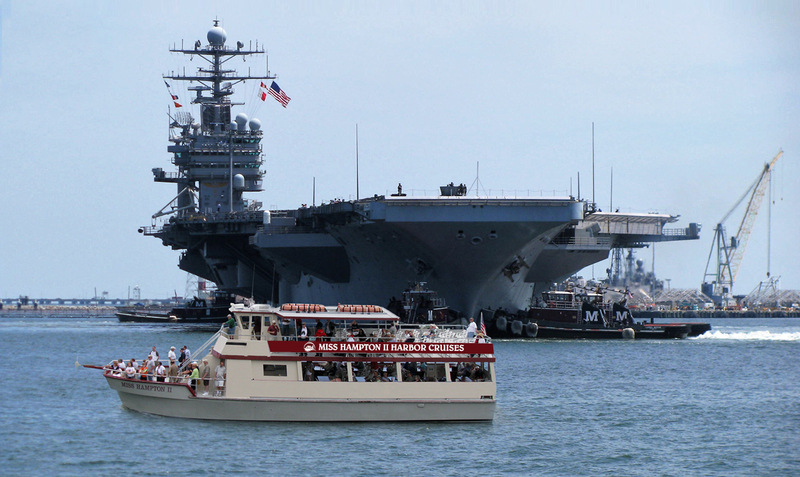 Tour prices (excluding taxes) for three-hour Harbor Tours are $27 for adults, $25.00 for seniors/retired militart, $17 for children 7 -12, and those 6 and under are free. Rate for active duty military (with ID) and current reservists is $13.50. There are also private charter cruises for groups of 50-117 available. Group rate is $24. Teen party cruises, which have a disc jockey, pizza and dancing, are an especially popular option for school groups.